Today, November 29th 2016, marks the 15th anniversary since the passing away of George Harrison. A remembrance event is being held from 6-8pm at George’s Hollywood Walk of Fame Star on 1750 Vine Street and fans are invited to bring candles and flowers. Full information on Beatles News. George Harrison holds a very special place in Genesis Publications’ history. His book, I Me Mine (1980) was our first ever music publication, and its format - combining handwritten lyrics, photos and personal recollections - created a new and intimate way of sharing his life and work with fans. Genesis Publications are very proud to continue to work with Olivia Harrison and The Harrison Estate to carry on George’s creative legacy. 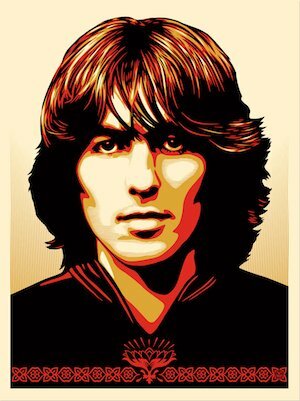 Left: This stunning portrait of George is by the acclaimed artist, Shepard Fairey, and is featured on the cover of the 2016 update, I Me Mine - The Extended Edition.